Things are getting hairy at the Kitsap County Prosecutor’s office. Today I went there to interview a dog, specifically a two-year-old yellow lab who is the county’s new canine courthouse companion (my story will run Friday, barring unforeseen circumstances). 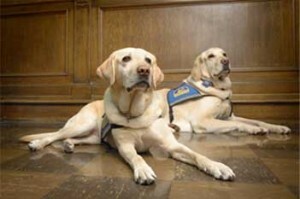 Such animals have been found useful in diffusing tension in courtrooms and other settings of the criminal justice system, especially when children must testify about crimes they have witnessed or experienced. Now before you go getting all upset about frivolous county expenditures, know that Kerris (that’s her name) was presented to the county courtesy of Canine Companions for Independence. And it’s no small gift, because these highly trained dogs cost CCI $20,000 to $30,000. Let me just say this. If Kerris ever runs for office, she has my vote. Speaking of animals at the courthouse, have you notice the assorted bunnies roaming around the parking lot behind the jail? They are always there, but hardly ever the same ones. Feral rabbits no doubt. But, I mean, why the courthouse? Which leads to another question … if elephants are Republican and donkeys are Democrat, to what party do the rabbits belong? I’m thinking they’re Socialists. And while we’re at it, what is with the donkey and the elephant anyway? Now, I wonder what party the chickens belong to?